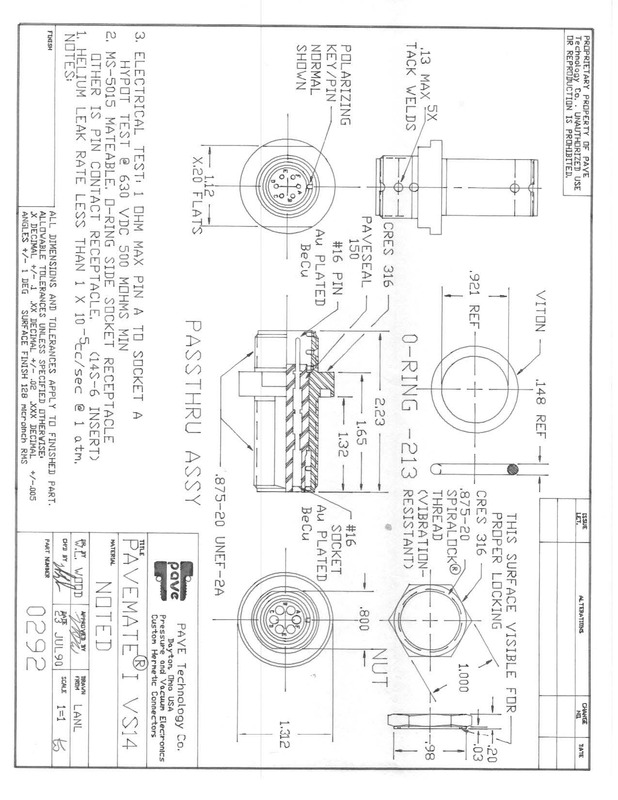 PAVE-Mate® I hermetically sealed multi-pin circular electrical feedthrough connectors are dual sided electrical male and female contact receptacles or plug connectors on each side of the bulkhead for low or high pressures or low or high vacuums. Signal, power, coaxial contacts, 2 – 128 contacts, #4 AWG – #26 AWG gold, silver or tin plated copper alloy contacts, RJ45 Cat 5e Cat 6 Ethernet, firewire, TBFH, USB 2.0, USB 3.0, MDR, or Pushthru for nuclear or laboratory glove boxes. Most listed connectors are based on Mil-DTL-26482, 38999, 5015 contact arrangements plus others. Voltage rating varies, typical 600-1000V and higher. Bulkhead mounting styles include jam nut o-ring, NPT or custom flange type, o-ring or laser, electron beam weld. Connector plug coupling or mating styles are bayonet, threaded or push-pull coupling depending on the connector series. Since copper alloy contacts are used instead of the much higher resistance Kovar pins found in other hermetic connectors, PAVE hermetic connectors offer much better electrical conductivity and amperage capability also with high dielectric or voltage ratings. The PAVE hermetic electrical connectors are available in all contact arrangements for military specification electric connectors plus commercial version electrical connectors. Leak testing can be either vacuum helium test or high-pressure N2 leak testing as required. The mating connector plugs, crimp or solder contacts, are normally supplied. PAVE-Mate® hermetic connectors are very robust and can be tested to pressures range from 80 psi to +3000 psi and vacuum up to 10^-8 Torr and temperatures from -100C to 200C depending upon the hermetic connector design, the o-ring compound used and matching the customer’s requirements. The hermetic connectors are also pressure or vacuum bi-directional either in the mated or unmated condition, though high pressures may be more limited in one direction. Hermetic leak rates are as low as 10^-9cc/sec. PAVE hermetically sealed connectors are NASA approved low vacuum outgassing rates and resistant to all types of fuels, gasses and most chemicals and radiation. 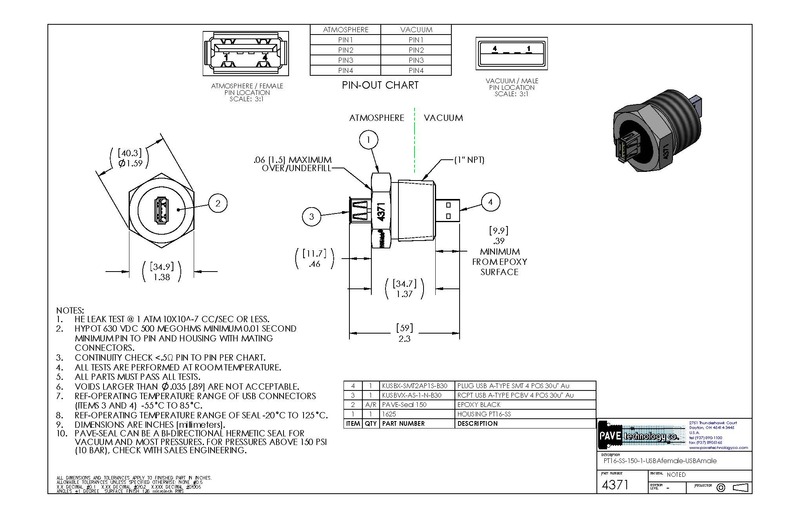 Standard hermetic connector designs are listed below and custom hermetic connector designs are also available. In a hurry? See our quick ship hermetic connectors.